Science now says "Consciousness Creates Reality"
Stemming from the newest discoveries in science which dwarf the old statement "Consciousness Effects Reality", we now find ourselves facing new discoveries of the actual potential of humans, namely, the 7th Sense. TULSA, Okla. - Nov. 10, 2017 - PRLog -- With the recent discoveries in science of astounding proportions where scientists are beginning to proclaim the validity of how humans actually affect the reality around us, even going as far as to say that "consciousness creates reality" and presenting the proof to support that statement, individuals have stepped forward to release information about the potential of humans. One individual in particular has risen to the challenge in an attempt to teach a workshop to assist others in understanding what they really are. Michael Puskas from Australia will be presenting before an audience at an ashram in the Blue Mountains area of Australia. Who is Michael Puskas? When we look at his past work we find a lot of production of music. Michael has owned a number of businesses in the past working with music in film projects and promoting musicians with his record label. He will be presenting what he is calling "The Steps to Developing the 7th Sense". Michael tells a story of his transformation stemming from recent times in his life. A story of unusual and extraordinary events which brought him to the ashram to work in music. Michael explains that the workshop is designed to assist individuals to align properly in a process which assists them to begin the path to becoming their own potential, a path of self empowerment for each one. Lessons of alignment are given coupled with explanations of proper behavior in life when interacting with others. Then tools are given which Michael explains will actually allow the individual to "change the approaching events in their life". Michael says that the changes which can come very quickly from following his teaching are very noticeable by the individuals as the simple steps actually accomplish very complex things. Things that have immediate effect on each individual as they apply the knowledge in their lives. 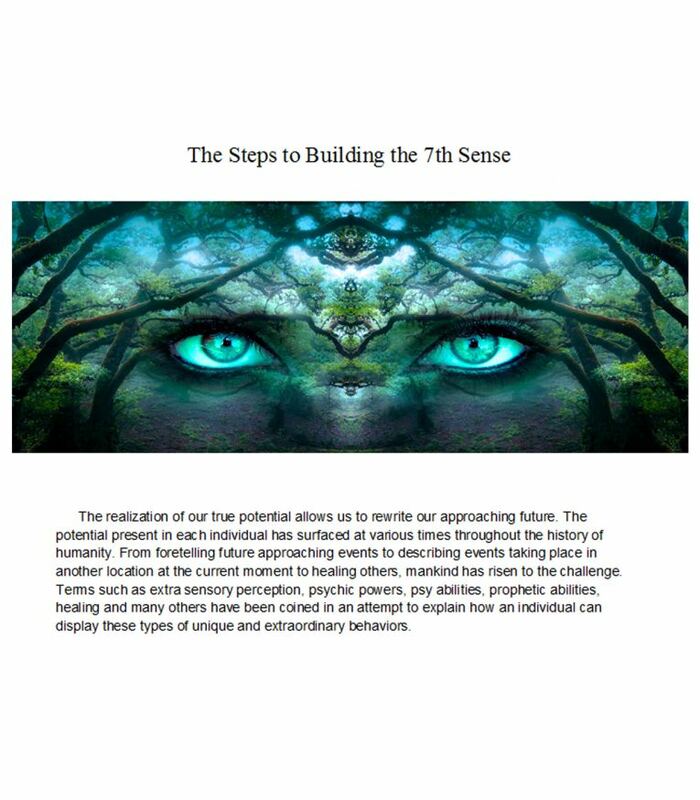 As Michael prepares his workshops, we find on Amazon a new book being presented by Author Guy Lozier called 'Building the 7th Sense' which appears to be part of the movement showing up across the planet. Who is Guy Lozier? On cursory searches it can be found that he is an author, film director and producer in America. He has written a number of books and appears to be preparing to release a number of other books with this one being just released. Guy explains that his stories are exciting and filled with hints of the potential resident in all humans. A potential which has been hidden in the history of the human species. When asked about his relationship with Michael Puskas, Guy explains that Michael is a wonderful individual who desires to assist humanity to become their potential. "I am thankful to know Michael, to have met him and to work with Michael to assist him in any way I can. Michael is a very special individual who is driven to great heights by his desire to assist the world. He works tirelessly to promote knowledge concerning sound resonance along with its healing effects and other properties but even more he has developed in his life to become a teacher of the people. Michael has special knowledge which he is sharing with the world in an effort to assist humanity to accelerate a process that is in place and manifesting in the future. I am helping where I can and one method i've chosen is to write a book to support what is taking place in the evolutionary steps on this planet which also supports Michael's work. Michael inspired me to write the book several years sooner than I had planned. It is a very powerful book." Most of Guy's books have been unavailable this year as he explains he was recently picked up by a publisher which had all his books removed from shelves as they are edited and republished. Guy explains that his books will be re-published very soon now and back on the shelves but also Guy says he will be on tour signing books and attending speaking engagements. When asked about his film career as a director and producer, Guy says he has several films in stages of development including an upcoming documentary. Keep an eye on these two as they bring forth what appears to be new knowledge concerning the potential we as humans possess but as Guy explains, "People have these abilities but they are generally locked away beneath the layers of consciousness which preclude nearly all from consciously displaying them into our reality." We can't wait to see what comes from their work. Follow them on facebook and other social media outlets. You can find them as Mike Puskas also or Guy as Mark Lozier since that is his middle name he explained. Below is the video showing some basic information of the workshop.